FERRARI is one of the most known Italian fashion lines of luxurious clothing that was founded in 2002. The idea of creating the brand FERRARI was to satisfy the tastes of fans of Formula-1 and provide them with proper clothes. The designers of the FERRARI believe that the line must combine speed, drive and excitement. In the begging of its existing, the collections were dedicated for men only, but the manufacturers decided that the products of the FERRARI will make young boys and teens manly and fearless. The main feature of the brand is using red color in all its items. Stylish T-shirts, dungarees, bright trousers, baby bibs with car prints, knitted hats and caps are made from high quality fabrics, such as 100% cotton, wool, denim, velour and others. The items of the FERRARI are embroidered with the logo of a company. The creative designers guarantee the mix of comfort and remarkable sporty look of a child. The collections of the famous line can be divided into two categories: Fan Collection is produced for fans of Formula-1 only. It expresses the brave nature of a boy. The second one, Lifestyle Collection, differs by creating an elegant and luxurious appearance. 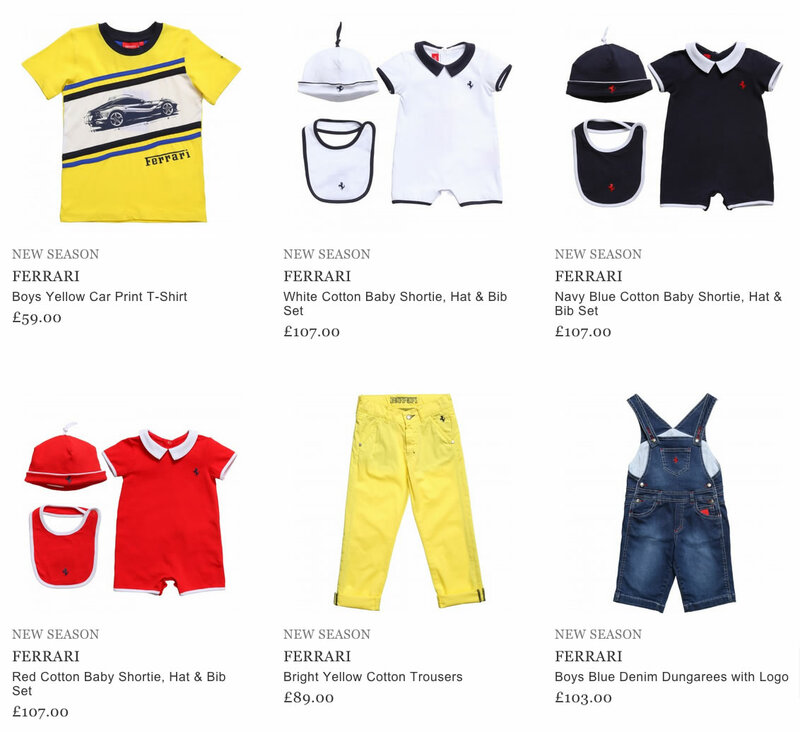 Nowadays parents can purchase the products of the FERRARI brand online.